The minimum purchase age is 18 years. Europe (Germany, Austria, Belgium, Bulgaria, Czech Republic, Denmark, Estonia, Finland, France, Greece, Holland, Hungary, Ireland, Italy, Latvia, Lithuania, United Kingdom, Poland, Romania, Slovenia, Slovak Republic, and Sweden) 3-5 business days when you get the email items have left our warehouse. NOTE: If the order includes custom pillows the term will be 7-10 working days. 1. Shipments are made through a courier company. When the order is ready to leave our warehouse you will receive by mail a pager number with which you can track your order from their website. 2. The shipping costs include in all cases the value added tax (VAT), but no other tax, fee or surcharge. 3. Shipping is defined as the delivery of items registered or address specified by the customer during the ordering, delivery zones limited as those listed above. 4. Boho Deco Shop is not responsible for any delivery delays caused by courier. Shipments to Europe will not be sent refills. 6. Orders placed by transfer DO NOT reserve the items, so if you are WITHOUT stock at the time of making the payment we would contact you to resolve the incident and send the order, or return the corresponding amount in the As soon as possible. After 7 days from the date of the order, if there has been no proof of payment, Boho Deco Shop will proceed to CANCEL the order automatically. 7. Orders placed during promotions, holidays or similar, may be delayed up to 15 business days. 8. Offers and promotions will be subject to special conditions. It is excluded for orders only for landfills, according to clause 5 of our conditions. 9. In case of web error, the client will be informed as soon as possible. If a response is not received, the order return / cancellation will be processed within a maximum period of 72 hours. Orders over € 50 (VAT incl.) Will be sent free of charge. Only valid for peninsular orders. Wooden articles are made and painted by hand, so may differ (sizes, shapes and even slightly in color) with each other. Also, the timber may have different imperfections such as knots, cracks ... that make the object has a singularity itself, but discard those pieces that would not put ourselves at home. Boho Deco Shop can offer deals or discount using coupon for a limited time, respecting offers if prices are valid during order confirmation by the customer. Boho Deco Shop reserves the right to change prices, offers or other trading conditions without notice. If for any reason the customer is not in accordance with the purchased item, you can opt for a refund, within a period of 14 days from the receipt. Having due before notifying Boho Deco Shop info@bohodecoshop.com writing a mail indicating the date and the order # to locate purchase. For our part, when we receive the mail, we will communicate through email, the receipt. The return will be accepted only if the product is returned in perfect condition. In the event that the return is made for reasons not attributable to Boho Deco Shop, the Buyer will bear the costs generated by that return (round trip), from € 5.95. They are considered no fault of Boho Deco Shop product changes, color or other characteristics, which are due to a change of customer, or the same mistake at the time of ordering. If the return of defective products is lawful, Boho Deco Shop is who will pay for the shipping as long as the buyer that circumstance at the time of receipt of order. The buyer may choose to order a product in exchange for that is returned or request a credit of the amount paid (which will take place in a maximum period of 30 working days from receipt of the product in our stores). All illustrations, store name and store photos are protected by copyright law. Any misuse can be prosecuted. The visit to this web site does not imply that the user is required to provide any information about yourself. In the event that the user provides any personal information, the data collected will be used for the purpose, in the manner and with the limitations and rights stated in Organic Law 15/1999, Protection of Personal Data. The purposes for which the data collected will be specified in the data form itself, including the management of the registered user, sending commercial information of future campaigns, products and / or services by post or by electronic means, including SMS, and surveys. Users who provide personal details unequivocally consent to the inclusion of their data in a file which is responsible Boho Deco Shop, as well as computerized or not of the same treatment. For the realization and track purchases or other customer services that can be implemented in the future, you must register your personal details and choose a password for access to restricted areas that require prior identification. This will prevent its completion in the future. By the time you register on our server or place an order, your personal and household data and transactions and current are incorporated into our database, used solely to process your order and to perform their Follow up. If you have given your consent, and while not revoked, also its used to send information on offers and services that may be of interest. At any time you can modify your registration data (change of address, telephone number or ask ....) reminder of your password if you forget it. We also inform you that in accordance with Law 15/1999 of December 13, Protection of Personal Data, and other applicable legislation on data protection of personal data contained in this form is incorporated into a file owned by Inés Torres Jimenez in order to channel requests for information, suggestions and complaints of customers for their management and resolution. The client can exercise the rights of access, rectification, opposition and cancellation by contacting INES TORRES JIMENEZ Ref . : LOPD, C/ Cuenca 23 entresuelo C (46007 - Valencia) or via our email address: info@bohodecoshop.com, in accordance with applicable law and may request information. The buyer is subject to the Courts of the city of Valencia with strict waiving their own jurisdiction, if other, for any dispute that may arise due to purchases made at Boho Deco Shop. All orders placed Deco Boho Shop implies knowledge and acceptance of these General Conditions of Sale. The data collected will be used for the purpose, in the manner and with the limitations and rights set forth in Organic Law 15/1999, on the Protection of Personal Data and with Royal Decree 1720/2007, of December 21, by which the Regulation of its development is approved. The purposes for which the data will be collected will be specified in the data form itself, including the management of registration as a user, sending commercial information of future campaigns, products and / or services by postal mail or by electronic means, including SMS, as well as conducting surveys. As of May 25, 2018, the General Regulation of Data Protection (RGPD) will apply to all companies, establishing new obligations and rights in the area of ​​Data Protection within the framework of the European Union. From Boho Deco Shop we want to take this opportunity to remind you of our commitment in general to compliance with regulations and, especially, in terms of Data Protection. 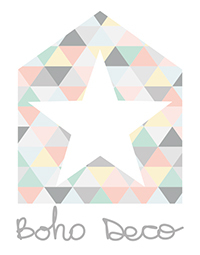 Your personal data is processed to manage the fulfillment of the contract signed by the client with Boho Deco Shop. In particular, sale of items, billing, communications related to sales, etc. Boho Deco Shop does not carry out automated personal data decisions nor elaborates user profiles. Boho Deco Shop will keep your data to the extent that the client gives his consent and the company maintains its activity, and the conservation of the data is necessary and relevant for the fulfillment of the contractual relationship. In the event that you expressly consent during the registration or order process, Boho Deco Shop may send you commercial communications by email regarding the products offered by Boho Deco Shop and, in particular, products purchased by the customer. You can revoke your consent at any time through a document addressed to Boho Deco Shop (C / Travesía de los Baratos, 9 - 5 46470 - Massanassa - Valencia, through the contact form, or at info@bohodecoshop.com) and you will have the opportunity to do it in every communication you receive by email. The data that we request for the formalization of the sale are necessary for the fulfillment of the same. In case of not wanting to provide any of the data, hiring might not be possible. - Your data will not be processed to offer services and promotions offered by Boho Deco Shop in case you have not consented to receive commercial communications or, having done so at first, you have revoked your consent. - Boho Deco Shop never gives your data to third parties or companies. Communication to Public Administrations in compliance with the Law. - The data relating to the contract will be communicated to the Tax Administration for the purposes set forth in the General Tax Law and the Law on Measures for the Prevention of Tax Fraud, as well as any other Administration to the extent that Boho Deco Shop is required, by law, to make such communication. You have the right to exercise your rights of access, rectification, deletion, opposition, portability of your data and limitation to their treatment, which do not seem appropriate, provided they are not required or permitted by law. If, at any time, you consider that any of your rights has been infringed by Boho Deco Shop, you may file a complaint with the data protection control authority (Spanish Data Protection Agency). At the moment of proceeding with the collection of the data, the voluntary or obligatory nature of the data object of collection will be indicated.